Especially when Mr. Taylor sings them in a voice that is both astringent and soothing, he conjures the image of a lonely cowboy murmuring to himself by a campfire in the mountains. The sadness and comfort that these songs evoke are two sides of the same coin. Like no one else’s, Mr. Taylor’s music distills a primal American yearning that can never be completely satisfied: the dream of home sweet home. A “Roots” evening next Wednesday will concentrate on music he heard while growing up. “Guitar Conversations” on May 6 will team him with some of his favorite guitarists. 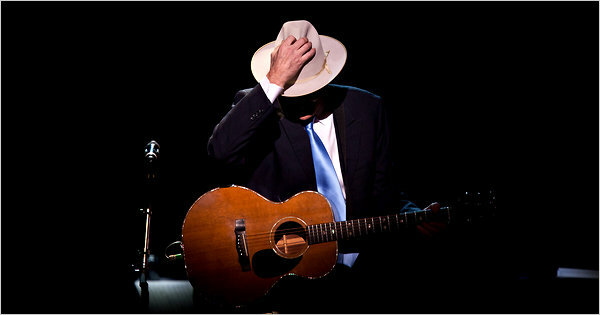 And “Quintessential James Taylor,” on May 9, will be an anthology of the songs that Mr. Taylor is proudest of. Tuesday’s gala, a retrospective of Carnegie Hall’s history, encompassed Broadway, jazz, folk music and comedy. Featured guests included Bette Midler, Barbara Cook, Steve Martin, Dianne Reeves, Sting and two choruses. A somewhat shaky “There’s No Business Like Show Business,” a song very much off Mr. Taylor’s beaten track, led off the show (directed by Scott Ellis), during which photographs of stars who have appeared in the hall were flashed onto a screen at the back of the stage. A flexible band playing musical arrangements by Charles Floyd negotiated the stylistic leaps from vaudeville to folk to rock with impressive agility. Ms. Midler channeled Sophie Tucker in a medley that included “Some of These Days,” “After You’ve Gone” and “My Yiddishe Momme.” Demonstrating her stylistic audacity, she leapt from an understated “Pirate Jenny” to a raucous “Sweet Blindness.” Mr. Martin, whom Mr. Taylor introduced as “a banjo-playing fool,” led a bluegrass ensemble through “Foggy Mountain Breakdown” and leavened the evening with sly witticisms. Although Ms. Reeves performed only one number, the Billie Holiday lament “Don’t Explain,” it was a killer. Paced very slowly with minimal accompaniment, she sang as though she were dragging the weight of the world behind her. But the evening’s most compelling performance was Ms. Cook’s “Here’s to Life.” To hear this indestructible woman, who is now 83, muse, “I had my share, I drank my fill/And even though I’m satisfied, I’m hungry still” in a voice that has lowered without shedding any of its luster was to receive lines of personal scripture torn from the soul. The notion of a James Taylor-Barbara Cook duet may have sounded promising in theory. But as they regaled each other with choruses of “Not While I’m Around,” from “Sweeney Todd,” like son and mother, their voices didn’t match. The show’s only outright failure was its attempt to cover comedy by having Kevin Pollak impersonate Lenny Bruce in an excerpt from a live recording that Bruce made at Carnegie Hall. The impression was deft, but the material hasn’t held up. The appearance of Sting late in the show, singing “Penny Lane,” gave the evening a sudden lift. From then on it was smooth sailing. And when the Tanglewood Festival Chorus arrived to join Mr. Taylor and Sting on “How Sweet It Is (to Be Loved by You),” euphoria reigned. Who knew, until Mr. Taylor put his stamp on it in 1975, that this Marvin Gaye standard could be transmuted so seamlessly into an upbeat folk-pop chorale? After former President Bill Clinton made a pitch for the Weill Music Institute’s education programs, a second group, the Young People’s Chorus of New York, trooped down the aisles to sing “Shower the People,” and the collective joy intensified. “It’s what I think of as the anthem of Carnegie Hall,” he declared.